“It will be the end of the world as we know it if the federal government doesn’t reform its fiscal ways!” trumpets Rep. Jason Chaffetz, a Republican from the grand state of Utah, in a Op-ed for The Hill this week. He’s freaking out, as many conservatives are, over the size of the federal deficit. He comes armed with brazen solutions, but none of them, of course, involve raising taxes. When a conservative says he can fix huge budget problems without asking the super-rich to pitch in, our advice is to duck. “Of course,” he writes, “the reaction from the Left has been predictable: we need more revenue from rich people and oil companies.” Well, yes, that would be nice. We’ve never figured out how oil companies and billionaires somehow got let off the hook on paying their fair share (except, of course, that their money eats politicians). 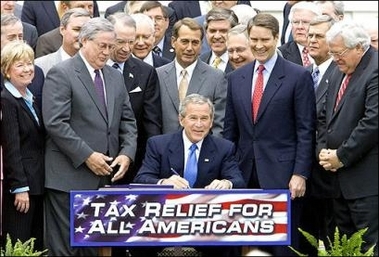 Conservatives are allergic to letting the Bush tax cuts expire. The word “tax” makes them feel as if they’re being attacked by bees. Yet they’re committed to eliminating the deficit. Since eliminating the federal government entirely would leave them all unemployed (like so many Americans), they must have some ideas on how to raise money. (Just never call it a tax.) So what do YOU think? What are some other creative ways the GOP can think of to reduce the deficit without killing the Bush tax cuts?